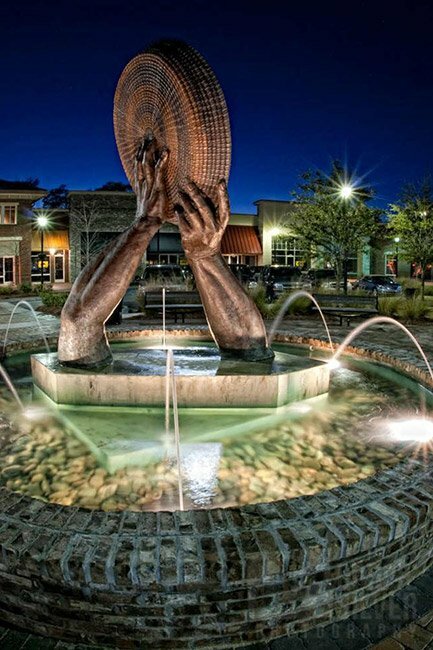 This bronze sculpture called Winnowing Hands adorns a fountain within the Market at Oakland Shopping Center in Mount Pleasant. The work depicts a sweetgrass basket in the hands of its maker. 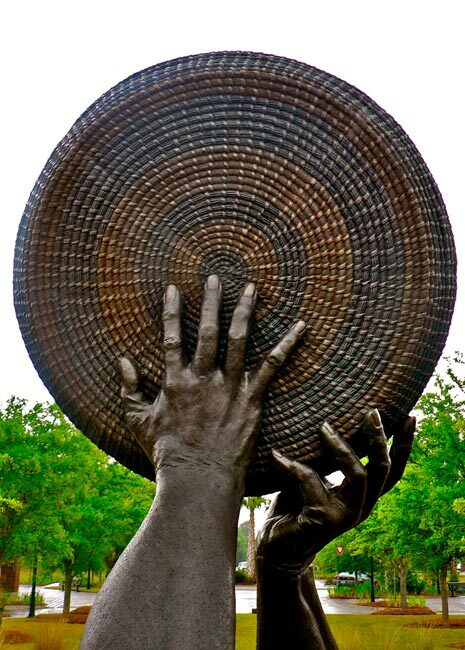 Winnowing Hands was sculpted by California artist Shirley McWorter-Moss and was unveiled in the plaza in May of 2008. The shopping center sits along a section of United States Highway 17 known as the Sweetgrass Corridor in honor of the sweetgrass basket makers who work along the popular road creating and selling these artisan wares. While people associate the word “weaving” with basket making, the technique used to produce these baskets is, interestingly, coiling. Often times coilers will include a design or pattern within their baskets that indicate their heritage, similar to a family crest. Coiling the sweetgrass (Muhlenbergia filipes), one of the primary materials used in the baskets, ensures that the baskets are water-tight, an important feature considering the baskets’ original use. As the title of the sculpture indicates, the baskets were used in the winnowing process of rice cultivation before the advent of rice mills. Though they weren’t used to hold water, it was important that the baskets were tight enough to prevent the loss of valuable rice grains. Slaves from West Africa introduced rice to South Carolina when they were involuntarily brought here in the 1600s. Though the plantations of the South Carolina lowcountry prospered enormously from this market, it was the slaves who initially taught planters how to grow and process rice. The popular variety known as Carolina Gold rice could be grown only in South Carolina and the sea islands of Georgia, making that grain especially profitable. The crop was labor-intensive; in 1850, the average cotton plantation used around 25 slaves, while rice plantations required roughly 225. After rice was harvested, it had to be “threshed,” or beaten with flails, to remove the rice from the stalks. The grains then were collected and “winnowed,” a process that involved gathering the rice and placing it into a winnowing basket (also known as a fanning basket), as these wide, shallow-lipped baskets are called. The rice was then tossed (“winnowed”), separating the grain from the chaff. The heavier grain would remain in the basket, while the light chaff would fly out. The final step before packaging the rice into barrels to be shipped was pounding the grains with an enormous mortar and pestle so that the husk could be removed. Again, the rice would be winnowed to separate the grains from the husk. Winnowing Hands beautifully depicts the strength and skill required not only to process rice, an industry that collapsed after the Civil War due to the loss of slave labor, but also to create the unique baskets that began as a functional tool during America’s bleak era of slavery. Today sweetgrass coiling continues, the resulting baskets appreciated as works of art. I visited S. Carolina briefly while stationed at Ft. Bragg NC, as a 82nd Airborne medic, 76-79. I’m from the SAN FRANCISCO BAY AREA. If I’d known about the beauty of South Carolina in 1979 I might have stayed! Sorry about the Charleston Church tragedy – it reminded me of Kent State’s VIETNAM National Guard incident – and Gaby Giffords near death in Arizona. Guns have to be controlled! A lot of South Korean police do not carry them, but they still are effective with the Korean people. Yours truly, Charles E. Nines: BA STANFORD 1970, Psychology.